Xzibit’s Journey Through Europe Builds Hype for Australian Tour, Win a Hummer Limo Ride! Xzibit is on his way through Europe at the moment, but in less than 2 weeks he will have found his way out here to Australia! 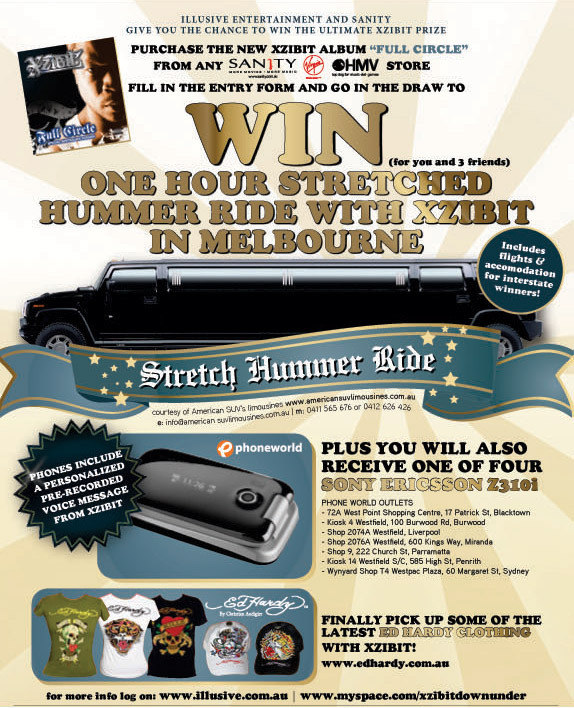 Win a 1 Hour Stretched Hummer Ride With Xzibit! Illusive Entertainment & Sanity are giving all Australian Xzibit fans the chance to hang out with Xzibit in a strectched Hummer Limo for an hour with 3 friends! The Hummer Limo will cruise through Melbourne, Australia – stopping off to pick up some of the latest Ed Harry clothing and a Sony Ericsson Z310i mobile phone with a personalised voice message from Xzibit will be hooked up along the way! All you need to do to enter the competition is to go to your nearest Sanity, Virgin or HMV music store – Purchase a copy of Xzibit’s latest album “Full Circle“, and finally fill out a form to go into the draw! It’s that easy, so get into Sanity, Virgin or HMV and pick up your copy today! To find out more, click here! For full terms and conditions log on www.illusive.com.au. Xzibit shows in Melbourne, Sydney, Adelaide, Perth and Brisbane! 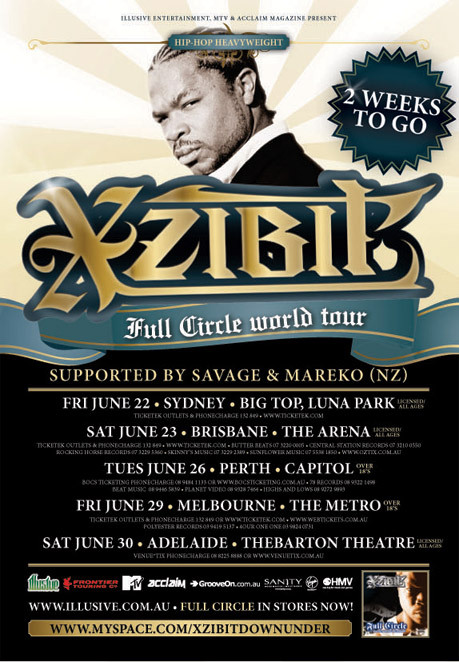 You’ve got no excuse to miss Xzibit’s shows here in Australia.X will be on stage in every major city, so there is nothing holding you back from checking out the Back 2 Basics Full Circle World Tour! Stay tuned to XzibitCentral.com for the latest Xzibit news, tour information and a new interview very soon! Xzibit has announced a great prize for winning the competition. But people who don’t live in australia can’t get this prize. It is also necessary to purchase Xzibit’s album form nearest store. The prized limousine is very comfortable and can make you popular in your friends. If you win the prize you will be the focus of everyone.